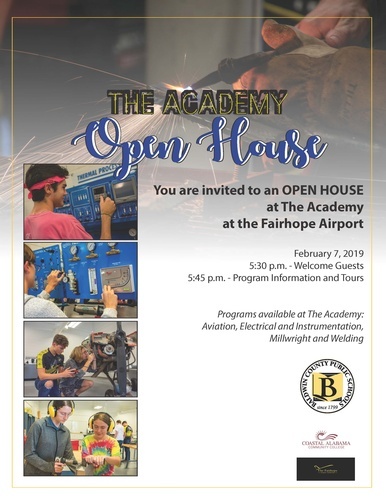 Current 9th, 10th and 11th grade students of Baldwin County High Schools are invited to an Open House at The Academy. The Academy offers high school students an opportunity to participate in dual enrollment in the career technical areas of Aviation, Electrical and Instrumentation, Welding and Millwright. The Open House will offer program tours and information about dual enrollment opportunities. 8600-B, County Road 32, Fairhope, AL. February 7, 2019, from 5:30 to 7:30 p.m.